Today’s Friday Favorite is – gasp – not a Happy Herbivore recipe. Shocking, I know. Nor is it a savory recipe like the last two have been. Instead, it’s a sweet recipe from my very first (and much-loved, if currently underused) vegan cookbook: Vegan with a Vengeance. VwaV is full of tried-and-true recipes, and I’ll likely include them in future Friday Favorite posts. But today I want to highlight a relatively simple recipe that I’ve made repeatedly, and always with excellent results. Check out my vintage food photography, circa 2009! I’m holding the Chocolate Thumbprint Cookies here. One is filled with cherry jam, and the other with apricot. I can never decide which variety I like best – usually it’s the one I’m eating at the moment. :) I’ve made these cookies quite a few times, and I posted about them here when I brought them to a gathering of friends. I always adjust the recipe, substituting vegetable oil for the peanut oil and extra vanilla extract for the almond extract, to make it nut-free for my family and friends with allergies. However, I once made an experimental version with peanut butter swirls and peanut butter centers, rendering them totally unfit for folks with allergies, but also totally delicious for those of us who can partake of peanuts. No matter how much I tinker with this recipe, I always get the most delicious, chewy morsels of chocolate-y goodness. And that, friends, is the sign of a worthy Friday Favorite. What’s your most tried-and-true cookie recipe? What recipes do you love from VwaV? Those look SO good, why’ve I never made them? My favourite recipe from VWAV has to be the raspberry blackout cake, I love it! I try and make every recipe in all my books, so I don’t often repeat. But I have made the sparkled ginger cookies from VWAV a fair bit, they are pretty reliable and awesome. Jojo is right about the cake, it is amazing! I also love the Miso Tofu stew recipe. 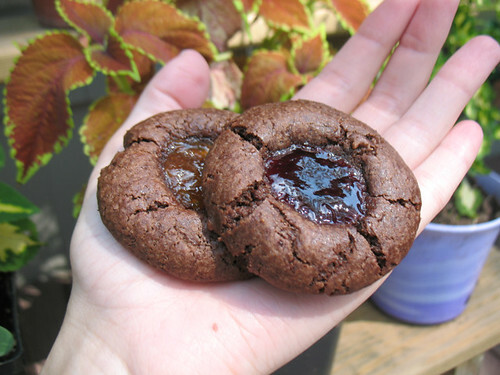 You should try blueberry jam in your thumbprints – so good!